What is the first thing that comes to your mind when you hear the words “job interview”? Most probably, you will picture a fancy office at a company’s headquarters, a conference room and a desk and a serious looking interviewer behind it. And you, in a suit, prepared for formal questions such as “What is your current situation?” or “What are your financial expectations?”. And you would be right! Partially. – a screening call with a headhunter? – a lunch with a former colleague? – a casual meeting with a known recruiter? The answer should be three times “yes”. 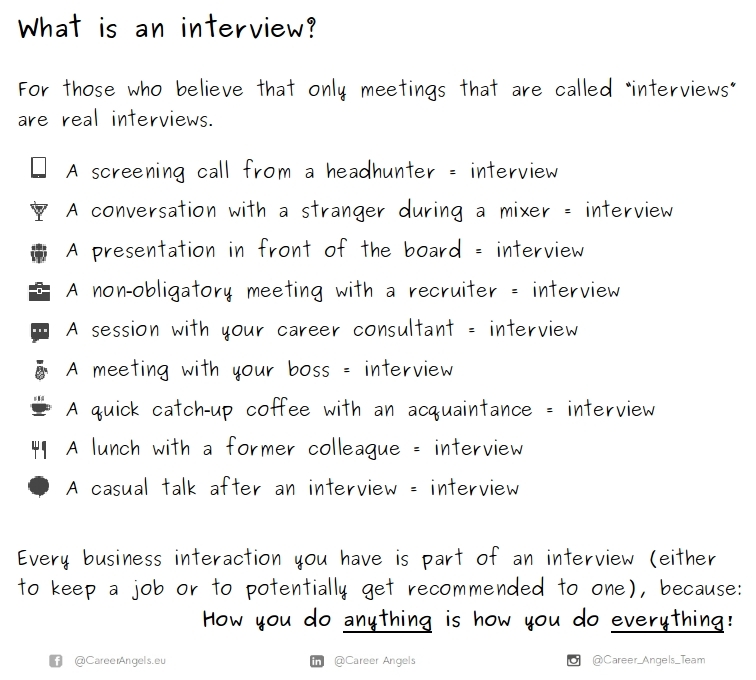 Take a look at this image and repeat after me: every business interaction you have is an interview. Just most of the time you are not aware of it. – How to dress to impress an interviewer? Are you currently looking for a job? Already interviewing? Or preparing for interviews? Would you like to discuss this confidentially with a Career Angel, send an email to Bichl.Sandra (at) CareerAngels.eu or click here. Please note: the conversation / call of approx. 45 min is confidential, non-obligatory and free of charge.